Navy, at 5-0, and Army, at 4-1, reside at the top of this week’s Collegiate Sprint Football League standings. 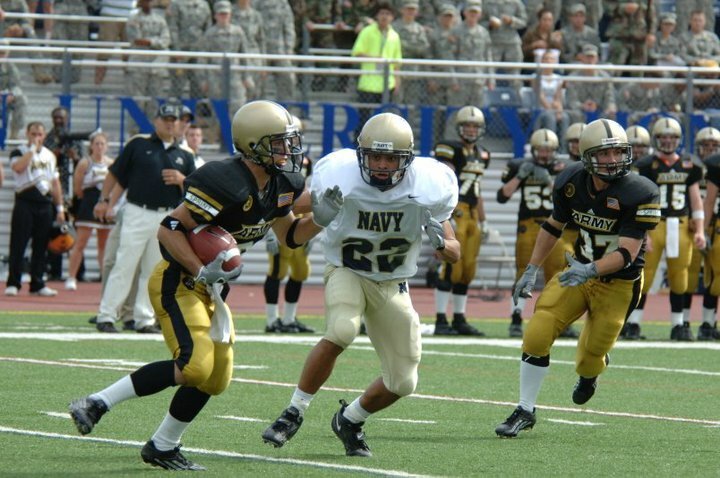 The CSFL, which includes teams from Army, Navy, Mansfield University (Pa.), Post University (Conn.), Cornell, Princeton and Penn, has been in existence since 1934. Sprint football is played just like regular football. But sprint players must adhere to strict weight and body fat standards to be eligible to play. According to the league website, a player must weigh 172 lbs. or less, have 5 percent body fat or greater and urine specific gravity less than or equal to 1.020. Football fundamentals and execution are emphasized in practices and in games, with strength training taking a back seat. Former Defense Secretary Donald Rumsfeld was the captain of his sprint football team at Princeton (when it was called “lightweight” football), and former President Jimmy Carter starred for his Navy squad.